Students participate in hands-on activities in the classroom before thaking their knowledge out to the field. 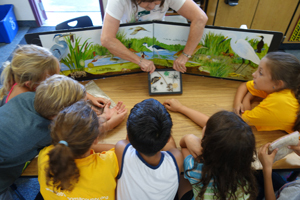 Above: "A Wetland Model" activity station. Students enjoy a field trip to a local nature preserve. Many of the Laguna's wonders are waiting to be discovered! 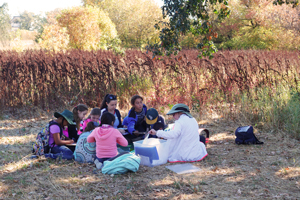 Would your students enjoy learning more about the wetlands environment here in Sonoma County? The Learning Laguna school program offers school children in the 2nd-4th grades a chance to learn more about wetlands, the Laguna watershed, and the flora and fauna of Sonoma County. The two-part program is offered each fall in September and October, and in the spring between mid-March and May. The Learning Laguna curriculum covers California State science and language arts standards. A morning of activities in the classroom when the children learn about wetlands and are introduced to the Laguna. A morning field trip the following week to a nature preserve in the Laguna to explore and deepen their undestanding and reverence for the natural world. Each class is taught by trained docents who work with students in small groups. Laguna Foundation docents are well trained in the science, ecology and lore of the Laguna. We introduce your class to the Laguna with a slide show followed by a 60-90 minute series of four, (or five if your class is larger than 26 students) fun, educational, hands-on activities. The activities are designed to expose students to the value of wetlands, introduce ecological concepts and vocabulary, and to prepare them for their field experience. Our goal is to provide a science based curriculum as well as to awaken the children's enthusiasm and senses to the wonders of the natural world. Field trips in the Laguna take place in the Sebastopol Wetlands Preserve (spring) or the City of Santa Rosa's Stone Farm (fall). Both properties are adjacent to the Laguna de Santa Rosa. Here is a map showing how to get there: Learning Laguna field trip sites. When your class arrives for the morning field trip (usually one week after class visit) they get the opportunity to explore the wetlands up close. They will identify aquatic life using magnifiers, observe nesting birds, and learn about native plants, among other experiences. They become wildlife sleuths, discovering evidence of river otter, raccoons, owls and many other species of animals and plants. Students get a glimpse of Pomo culture when they make a woven tule necklace. If this program sounds interesting to you, please explore the website for further information on the Laguna de Santa Rosa and the Laguna de Santa Rosa Foundation. For further information please contact the Laguna Foundation at 707-527-9277 x102 or email christine@lagunafoundation.org. We look forward to hearing from you soon! The object of our activities is to build an appreciation for the beauty, uniqueness and importance of the Laguna de Santa Rosa. The classroom activities prepare the students for their field experience by creating interest, excitement and knowledge about the Laguna. The activities introduce vocabulary and ecological concepts that the students will take into the field. The 15-minute activity centers are designed for 5-7 students. Each center has 1-2 docents running it. Students move through four or five centers (depending on the size of the class) within an 60-90 minute time period. Purpose: To visually acquaint students with the different environments of the Laguna. To provide a visual overview of the Laguna during the four seasons of the year. To create enthusiasm about the Laguna and its inhabitants. To introduce vocabulary and ecological concepts. Activity: Watch slide show, answer and ask questions about the slides. Slides are presented as an introductory whole-class activity. This activity gives the docents a chance to see what the students know or don't know about the Laguna. 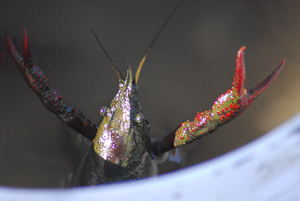 Purpose: Familiarize students with the variety of wildlife that live in the Laguna watershed. Discuss differences and characteristics of animal feet. Introduce concepts of carnivore, herbivore, and omnivore. Activity: Each student will make a book mark using animal track stamps and ink. Purpose: To encourage students to identify characteristics of various wildlife that live in the Laguna. Activity: Students learn identifying characteristics of animal groups then practice and take turns identifying specific animals using those characteristics. Purpose: To understand what/where wetlands are, what makes them special, and their function in relation to flooding, erosion and purification of water. Activity: Students will hold up objects that represent wetland characteristics as they listen to the description. They will spray the models as if it was raining and observe clean and muddy water moving through the model. Purpose: To introduce the concept of migration, why it occurs and the importance of food availability to migrating birds. To introduce the importance of the Laguna to birds traveling along the Pacific Flyway. Activity: A board game that emphasizes the variety of foods that birds eat, natural environmental events that effect food availability and a bird's ability to migrate. Purpose: To awaken curiosity about birds and hone observation skills and analytical thinking. To introduce/review the concepts of adaptation and camouflage, nest building, plus relationships between form and function. Activity: Students investigate a collection of bird skulls & beaks, feathers, nests, and feet to find evidence and answers to relevant questions.